This is the 12th post in the series, 14 Tips to Present Awesome Charts. What does it mean to highlight? To highlight (verb) means to make something more prominent. It is different from the noun highlight which means the most important part. We are concerned with the verb form here. You highlight a data point or a data series or a relation between two data points (or series). Example, highlighting one bar is a data point but highlighting a line graphs made out of 10 data points is a data series. When do you highlight something important? i. You highlight to point out the change in values of a variable (a growth in sales over time). By looking at the graph, the growth is obvious but the percentage is not. ii. You highlight to give a reason for change in values of a variable (a sudden fall in sales, a dip in share prices). The reason is not captured in the graph and hence needs to be separately mentioned. iii. You highlight to make something stand out. Something that is already there but as part of a crowd. Like your company's sales graph when compared to 9 other companies. iv. You highlight to bring out the relationship between two variables. You have plotted sales & profit bar graphs but profit percentage is not captured in the graph. You can highlight that. Examples illustrating instance 1 & 2: See the Chart #1 in the image below. This chart from ACC shows sales growth of the company over time. I have cropped out the EBITDA (profits) portion from the chart. They have highlighted (pointed out) 5% which is the change in sales. It is possible that industry was in a bad phase and 5% is something to take consolation from. Never highlight what puts you in a bad light unnecessarily. Chart #2 has been taken from FMCG major Dabur. They are showing quarterly revenue growth over the last 8 quarters. They are giving a reason (a clarification) that the good growth of 22.1% is not coming majorly from acquisition of another company Fem. The growth is mainly organic (which is a good sign). Chart #3 is from the website of Reliance Industries. Talking about world's largest refining companies they highlight their own place among 16 other companies by giving their bar a red color. This is a good way to stand out. In the same chart, they have also marked state-owned companies and made them stand out by giving it another shade of blue. Bad job. They should have used another color. Chart #4 presents the sales and profits of a hypothetical organization. Profit as a percentage of sales is important to know and has not been captured in the graph. 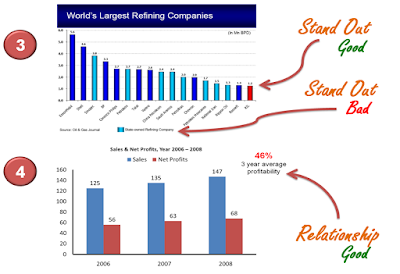 To bring out this relationship between sales and profits they add a text; '46% is the 3 year average profitability'. If you have carefully observed you will notice that color and shapes are used to highlight. Merely text is not sufficient. In Chart 3, if the RIL bar was given a gradient, the effect will not be as great. Using color is better and using red even better as it attracts the eye the most. Animation is a medium you should use to highlight. In Chart #2, after having presented and discussed the growth rates in sales, the presenter can on mouse click circle the 22% and make the attached text appear. Read more on animation here (Tip #11). Chart highlight is not the same as key message. While talking about key message we discussed that key message is the point you are trying to prove with your chart (to read about key message click here). Highlighting can be a good way of supporting your key message. The key message for Dabur in Chart 2 above could be; "We have grown very well over the years purely due to the efforts that have been put by the company. Contrary to popular belief it has not come from acquisitions like Fem in 2009-10." The highlight in this case supports the key message. How do you highlight important points in your charts? What are the occasions when the need for highlighting arises? Or, you are someone who prefers talking and not highlighting? Share it here. Leave a comment.